A bump in the road, blowing debris or sudden collisions can all bring unexpected damage to the windows on your vehicle. Your windshield is part of the structural integrity of your car or truck, but it has its limitations due to age and weather conditions. It only takes a split second for fragile glass to be cracked or shattered. 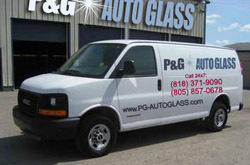 PG Santa Clarita auto glass repair specialists provide mobile services to local motorists. Parking a truck or car on a city or residential street is a routine task for many drivers. The constant crunch for time brings irresponsibility to some drivers and this may cause damage to windows of the vehicles of innocent people. PG experts for auto glass repair in Santa Clarita use the required tools and training to fix any window problem fast. Since damage to motor vehicle glass can happen at any time, it is difficult to plan your finances around such unexpected scenarios. There are no guarantees that auto insurance companies will pay all or part of glass damage to your car or truck. PG Santa Clarita auto glass repair specialists are available 24/7 to respond promptly to any report of damage. These experienced technicians come directly to you to eliminate traveling to a repair shop. Automobile window replacement is best completed by specialists with years of experience and the right training. Not every company that advertises online or in telephone books has a traceable record of satisfied customers. PG auto glass repair in Santa Clarita employs skilled technicians that install high quality OE auto glass that is guaranteed for the life of your vehicle. Every driver including commercial drivers depends on the strength and safety of the glass used in their automobiles. Commercial vehicles are not immune from damage in accidents involving other drivers and pedestrians. PG Santa Clarita auto glass replacement specialists know the complexities and specifications required to replace the windows in foreign and domestic vehicles. Finding reliable and consistent help for your auto glass needs takes only one call to PG auto glass replacement in Santa Clarita. Do you need a company that repair or replaces auto glass in Santa Clarita, CA in zip codes 91310, 91311, 91312, 91350, 91351, 91354, 91355, 91380, 91381, 91382, 91383, 91384, 91385, 91386, 91387 or 91390? You can rely on PG Auto Glass for repairs and replacements of all types of auto glass.